The genius of this recipe lies in its simplicity. There are really only two important ingredients here: chicken wings and balsamic vinegar. There are a couple of caveats, however: first, use fresh, not frozen, chicken wings. We’ve tried both and there is a noticeable difference. 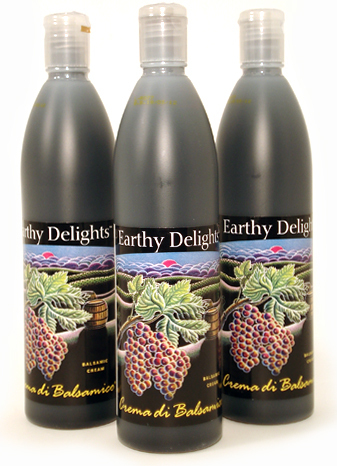 Second, use a good quality balsamic vinegar – an authentic balsamic from Italy, not a cheap, bargain-aisle imitation. A six year old balsamic is perfect; anything fancier would be wasted. Our favorite is a balsamic vinegar from Antico Borga, dubbed ‘Viola.’ This bright and sprightly young vinegar is inexpensive enough to use every day, but good enough for company. In this recipe, balsamic vinegar plays the dual roles of marinade and glaze, all in one. The wings are drenched in the vinegar where they languidly rest for six hours or as long as overnight, allowing the marinade to penetrate deeply into the flesh & skin. After the wings have been removed from their vinegar bath, they’re drained briefly, then grilled over a medium-high flame. They cook quite quickly, taking only about 15 or 20 minutes to become tender & juicy inside while the balsamic vinegar glaze chars slightly, caramelizing into a deliciously tangy coating that clings to every bit of skin. When you think about it, using balsamic vinegar in this way makes perfect sense. 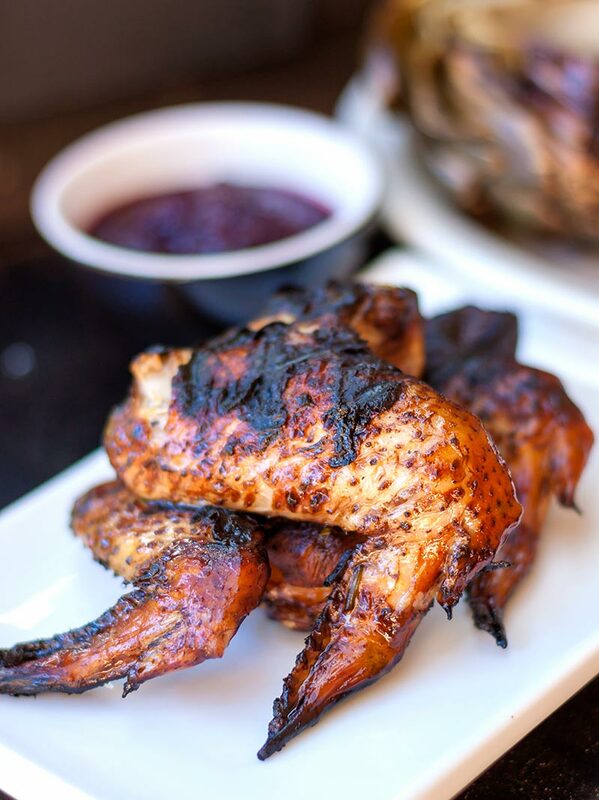 Many of the great grilling sauces, especially those for poultry, are a balanced mixture of sweet and sour, with sugars and acids combining to form a complex flavor that is mysteriously satisfying and pleasing on the tongue. So this week, give yourself a break, relax and skip the fancy preparations. Summer will be over before you know it. 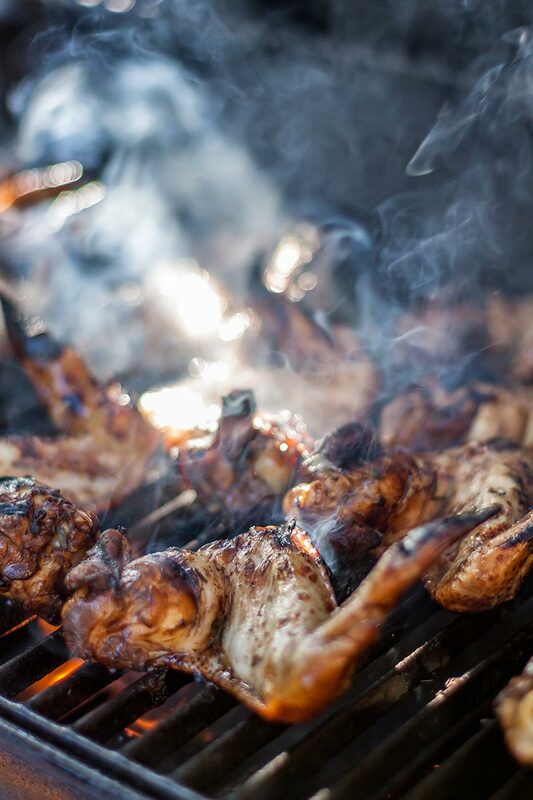 Don’t forget to take time to stop along the way and smell the grilling chicken. This sweet and rich balsamic vinegar marinade caramelizes to form a delicious glaze on the wings. 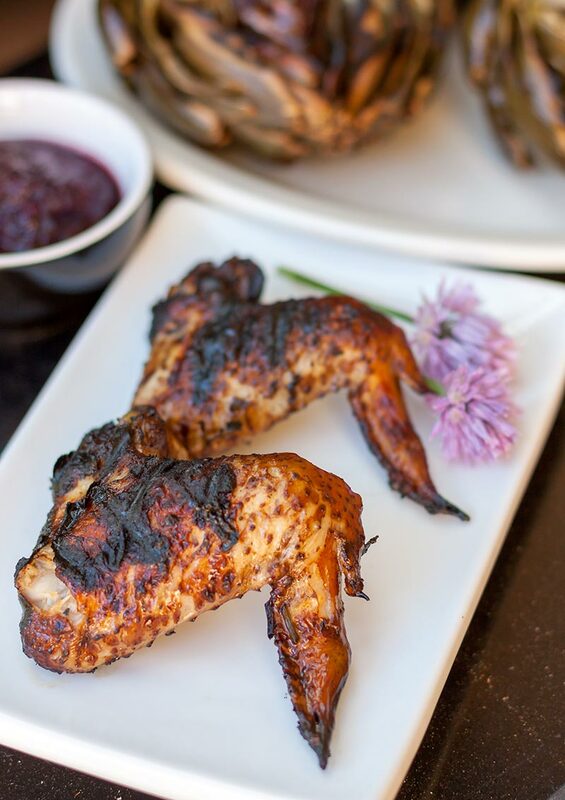 While these tasty wings can be grilled or baked, we prefer the crisp, sweetly charred texture and flavor that only comes from the grill. Combine the first 3 ingredients in a large bowl and toss to coat well. Cover and let marinate at room temperature for 6 hours or as long as overnight in the refrigerator. If refrigerated, remove the marinating wings from the refrigerator 30 minutes before cooking to allow them to return to room temperature. Remove the wings from the marinade and drain well. Preheat the grill to medium-high. Place the wings on a well-oiled grate in a single layer, and cook for 15 – 20 minutes, turning frequently and moving them around the grill, or until evenly cooked to a deep mahogany color. Preheat the oven to 450 and place the wings on a baking sheet in a single layer; bake the wings until crisp and deep brown, about 25 mins. Finish the wings with a drizzle of Earthy Delights Crema di Balsamico and serve with a side of homemade Cherry Catsup to dip them in. These tangy wings are equally wonderful whether served hot or at room temperature.